Installed a new booster and master today and began to bleed the brakes. (1975 F250 4x4 front and rear drums). The rear drums bled fine, the front drums did not. I could not get one drop of brake fluid from either front drum. I removed and cleaned both bleeders, and they are fine and not clogged. I thought it could be the proportioning valve that needs to be bled, but I my truck has a differential valve that does not have a bleeder valve on it. Here is a picture of what I'm working with...any suggestions? If so there should not be a need to bleed the system. 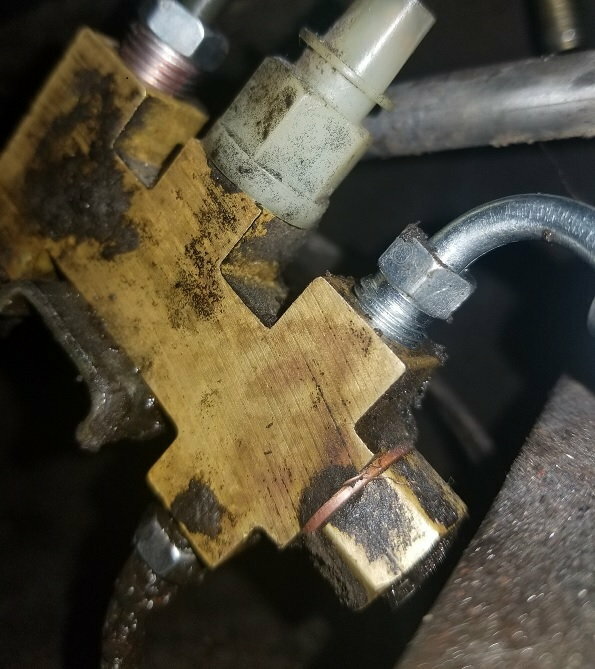 I have never seen a bleeder on any proportioning valve on anything I have worked on. Now I have seen proportioning valves that have a thing on one end that needs to be pushed in or pulled & held out when bleeding the system. Any thing like that on the other end of your proportioning valve? Yes I bench bled the master prior to installing. The differential valve has no external bleeder. I think the center piston is blocking the front lines. No idea when the brake fluid was changed on this truck so I'm wanting to bleed the old stuff out of the lines. This isn't accurate. Anytime you open any part of the brake system, it needs to be bled. You don't need to bleed the whole system if you just replace a caliper or wheel cylinder, for example, but that wheel needs to be bled. If you replace the master cylinder, bench bled or not, the entire system still needs to be bled. If your not getting fluid to the front besides plugged line or hose the proportion valve needs to be reset. It is meant to close off the front or back if there is a leak. Not able to describe the procedure hopefully you will figure it out. Well I played with it more today. Still nothing out either front drum bleeder valve, but I did however get fluid out of the front brake lines themselves where they enter the front drums. I cracked open the front lines at the drum, and fresh fluid flowed with ease.. But nothing out of the bleeder. Thoughts? Did someone step on the brakes as you watched fluid shoot out across the room. May have just been some still in the lines. If your sure your good up to there got to be the wheel cylinders. It's got to be something in the wheel cylinder then.